Starting with tracks can be an overwhelming venture on many levels. I remember when we first decided to use tracks for our Easter service and I was sitting down with a computer staring at Ableton (digital audio software) and frustrating myself because I don’t know how to turn the metronome on. Well, I eventually find out it’s called a “cue” and it’s a small discrete button that has two dots on it at the top of the user interface…obviously, right? So I’ve been there… I totally know what you are thinking, and its going to be ok and really really awesome. So I just want to go over a couple of things that have helped me and then get into some different gear options. 1. No matter what program you are using to run tracks, open it up every day and spend 30 minutes in it. It could be writing a song with a midi instrument, making a drumbeat, pulling in tracks from Multitracks.com and warping them, or going through tutorials. Just do something in it everyday until there is a comfort in how you use it… then when that happens… learn more! 2. Bring other people around you. If someone is remotely interested on your team, then do everything you can to bring them along side of you. Being in conversation with someone else makes you grow so much more quickly, and cements a better understanding of the knowledge you are acquiring. Lets talk about some gear. There are a couple of different DAW’s (digital audio workstation) that you can use to run tracks. Mostly commonly known is Ableton Live. This is what we use at Highlands at all of our campuses. It’s such a versatile program that we use to not only run tracks but to make program changes on our Nord keyboards, BPM changes to delay pedals, send SMPTE sync signal to our lighting board to sync lights and video content with the music, and a lot more we haven’t even implemented yet. 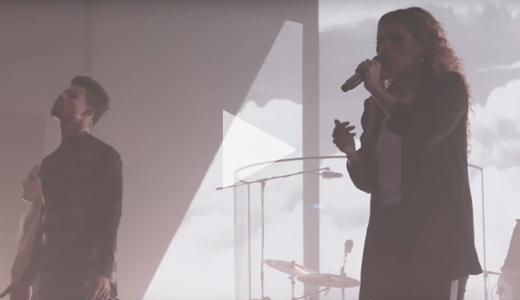 It’s a remarkable program that can really change the entire production value of your worship experience. The second DAW I want to bring in the conversation is Playback. This is Multitracks DAW that they have set up to play the tracks you buy and download from them to be used simply on an iPad, iPhone, or Android. You can download a free version of it from your respective app store and they offer a free download track each week so you can mess around with how it works. It’s pretty awesome. If you choose Ableton Live you will need to use a pretty rock solid computer. I really like the new Macbook Pros. I love the stability of having a solid-state hard drive, and at the very least a dual core processor. Check them out here. I’ve seen people using Macbook Air’s before so check them out if you need something a little cheaper. If you are using Playback, then any of the newer iPads should work just fine. You will need to use an audio interface for taking the audio out of the machine of your choice and getting it to the soundboard. 1. For multiple outputs and midi I would go with any of the Motu AVB series. We use them at our live-streaming campus (Grants Mill), and have never had a problem with them. I like the UltraLite the most. 2. For a cheaper, multiple output option, a lot of people use the Focusrite Scarlett Range. 3. If you are using Playback with an iPad, iPhone, or Android, your best bet for getting multiple outputs out of your device is the Presonus Audio Box iTwo. I hope this can help you navigate all of the many options that are out there!